Well here I am on Wednesday afternoon, it is a cool and overcast afternoon, feels like it is going to rain again. It rained this morning when I dropped Leo off at school and went to my aqua class but it fined up b around 10am. 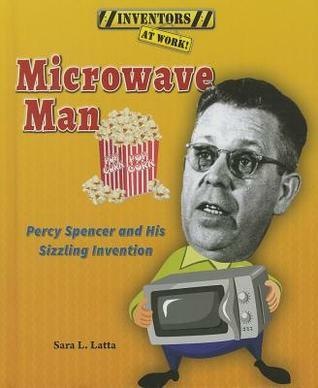 This week I am asking if you have heard of Percy Spencer, if not you are not alone as I haven't heard of him till I Googled who invented the microwave oven. His invention was an accident, that I had heard before, worked for a company named Raytheon, developing microwave radar transmitters during World War II. When one day in 1945, he noticed that a candy bar he had in his pocket was starting to melt. He was not the first to notice this phenomenon, but he was the first to investigate it. He decided to experiment using food, including popping corn kernels, which became the world’s first microwaved popcorn. 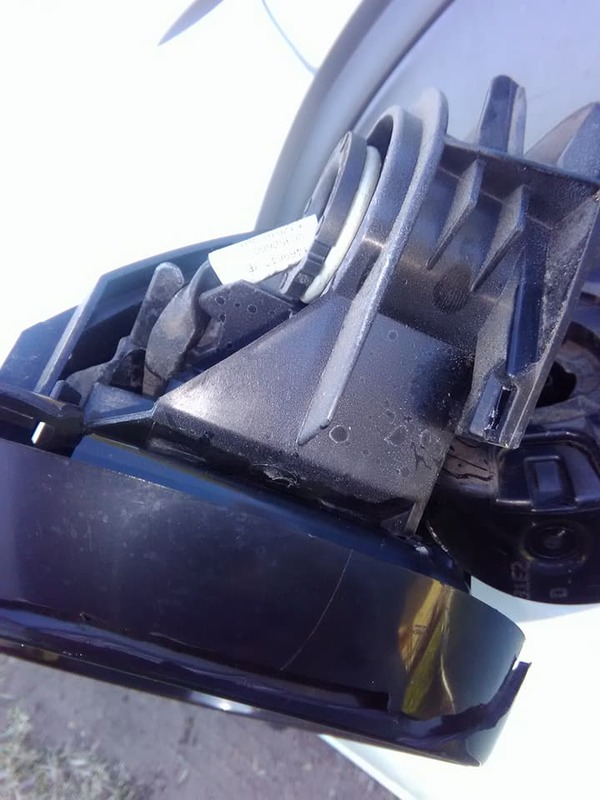 In another experiment, an egg was placed in a tea kettle, and the magnetron was placed directly above it. 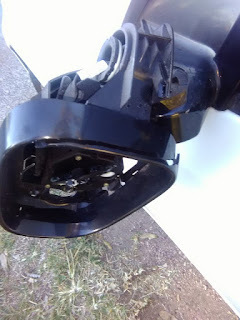 The result was the egg exploding in the face of one of his co-workers, who was looking in the kettle to observe. Spencer then created the first true microwave oven by attaching a high density electromagnetic field generator to an enclosed metal box. The magnetron emitted microwaves into the metal box blocking any escape, allowing for controlled and safe experimentation. He then placed various food items in the box, while observing effects and monitoring temperatures. 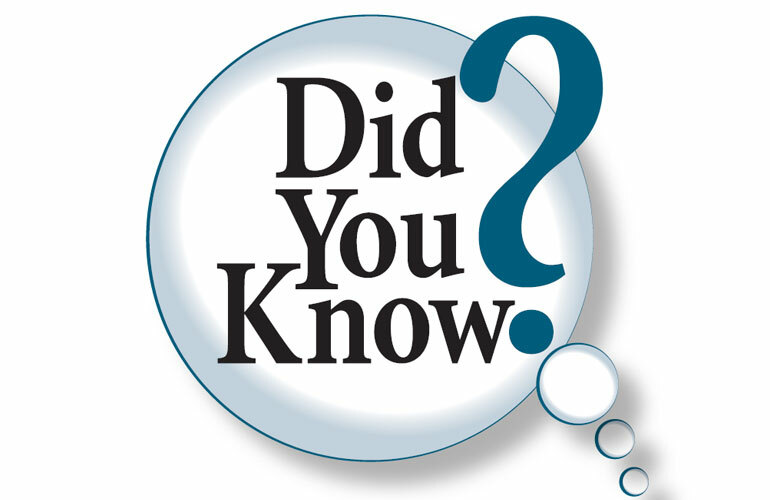 The first commercially produced microwave oven was about 6 feet tall, weighed about 750 lbs, and cost about $5,000 US. After the war he used radar technology developed during the war to invent the microwave oven, it was named the “Radarange” and was first sold in 1946, the company Raytheon later licensed its patents for a home-use microwave oven that was first introduced in 1955, but these units were still too large and expensive for general home use. The bench top microwave oven was first introduced in 1967, and their use has spread into commercial and residential kitchens around the world. In addition to their use in cooking food, types of microwave ovens are used for heating in many industrial processes. He was born in Maine 18 months later, Spencer's father died, and his mother soon left him in the care of his aunt and uncle. His uncle then died when Spencer was just seven years old. Spencer subsequently left school to earn money to support himself and his aunt. From the ages of twelve to sixteen, he worked from sunrise to sunset at a spool mill. At 16 he discovered that a local paper mill was soon to begin using electricity, a concept little known in his rural home region, and he accordingly began learning as much as possible about the phenomenon. At the age of 18, Spencer decided to join the U S Navy, he had become interested in wireless communications, while in the navy, he made himself an expert on radio technology: "I just got hold of a lot of textbooks and taught myself while I was standing watch at night." he is reported to have said, he then taught himself trigonometry, calculus. Chemistry. Physics and metallurgy among other subjects. By 1939 Spencer became one of the world’s leading experts in radar tube design. They are called box jellyfish because their bell at the top of the jellyfish it has four corners, as well as clusters of trailing, stinging tentacles that can stretch more than two metres (6.4 feet). Wow that is long. 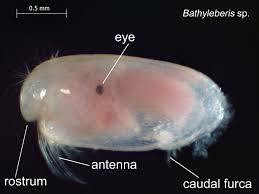 Human encounters occur most often when the box jellyfish comes close to shore to breed in estuaries. "That type of water is muddy, so you can't always see them and they can't see you," he added. If you're in the murky water and brush against one, you can easily be stung. While box jellyfish are found in warm coastal waters around the world, the lethal varieties are found primarily in the Indo-Pacific region and northern Australia. 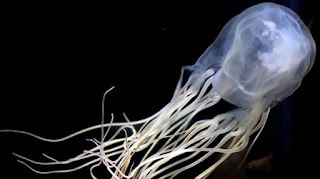 This includes the Australian box jellyfish, which is considered the most venomous marine animal. A box jellyfish sting can be unbelievably painful,the venom is designed to paralyse fish, so it immobilises your nerves and affects breathing and movement. A large dose can cause cardiac arrest and death within minutes. In North Queensland the big bellox jyfish are the most common jellyfish seen during 'stinger season'. It is so venomous it will kill you within two minutes if you receive two metres or more tentacle contact. If a tentacle touches the skin it results in a very painful sting. An 'immortal' jellyfish is swarming through the world's oceans, according to scientists. This jellyfish is able to revert back to a juvenile form once it mates after becoming sexually mature. Marine biologists say the jellyfish numbers are rocketing because they need not die. 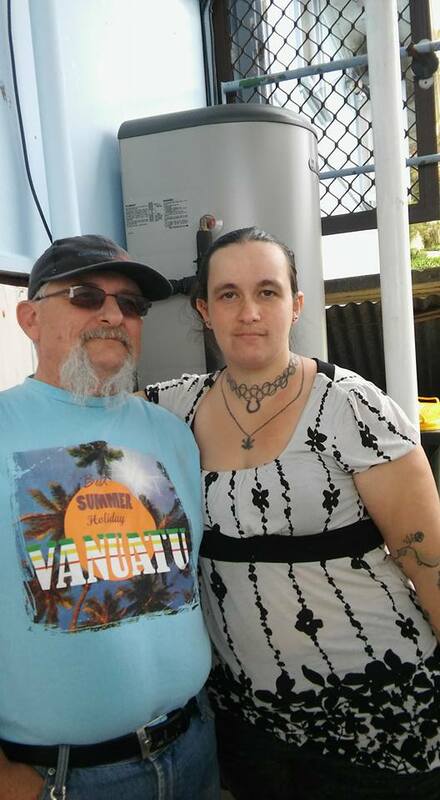 Hello Monday and world it is another nice day here in Newie, not too hot nor too cold, went to my aqua class now I am home for a while till the time comes to go get Leo from school. 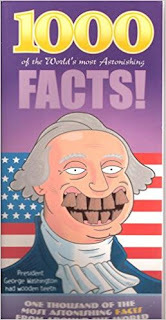 Anyway Monday means it is did you know day, so here are this weeks facts. When inventor James Hetherington first wore his new invention, the top hat in London in 1797, it caused quite a stir, so much that he was immediately arrested and thrown in jail because he appeared on the public highway wearing upon his head a tall structure of shining lustre and calculated to disturb timid people. In the 15th century a man was given the title “official uncorker of bottles” by Queen Elizabeth1. A law was passed that stated all bottles found washed up on beaches had to be opened by this man and no one else, in case they contained sensitive military messages. The penalty for anone else opening a bottle was death. Hello everyone, here we at this lovely Thursday, didn't do a post yesterday, why you wonder, well I went to my aqua class as usual but I was that tired that at one stage I nearly fell over that said I stuck it out. After the class I came home and got changed before going and getting fuel for the car and then down to the shops to get a loaf of bread and more crumpets. Around 1.50pm Jessica rang me to tell me that she didn't have an afternoon run as all the children she drives got sent home sick, so she was able to get Leo from school, if I could have I would have done a happy dance. Hello everyone, what a start to the day, driving Leo to school this morning I misjudge distance and hit something and did this damage to the car. Leo was worried that papa (Tim) would go mad at me and kept telling me it was just an accident and the car can be fixed and not to get upset about it. 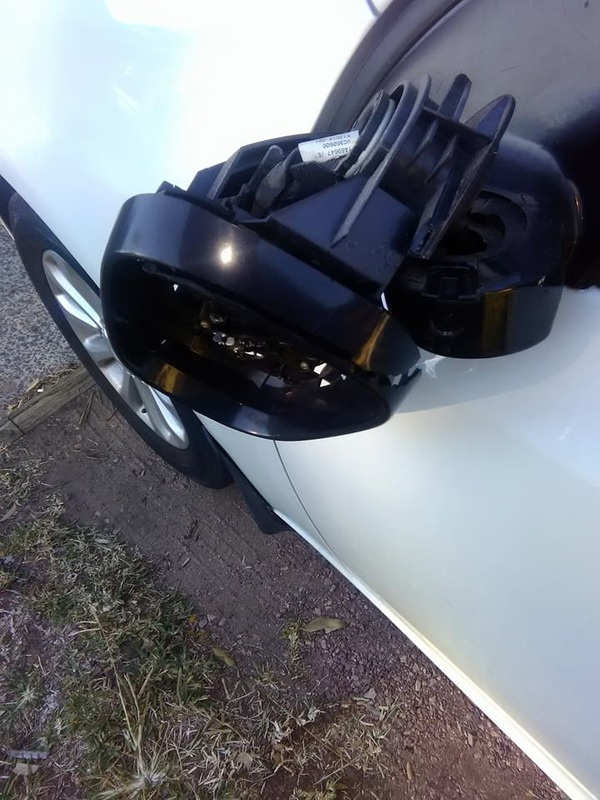 I took photos and sent them to Tim, who said he is worried about my driving as in 18 months I have had three incidents of misjudgement and yes at times I am also concerned but overall there is not much wrong with my driving. 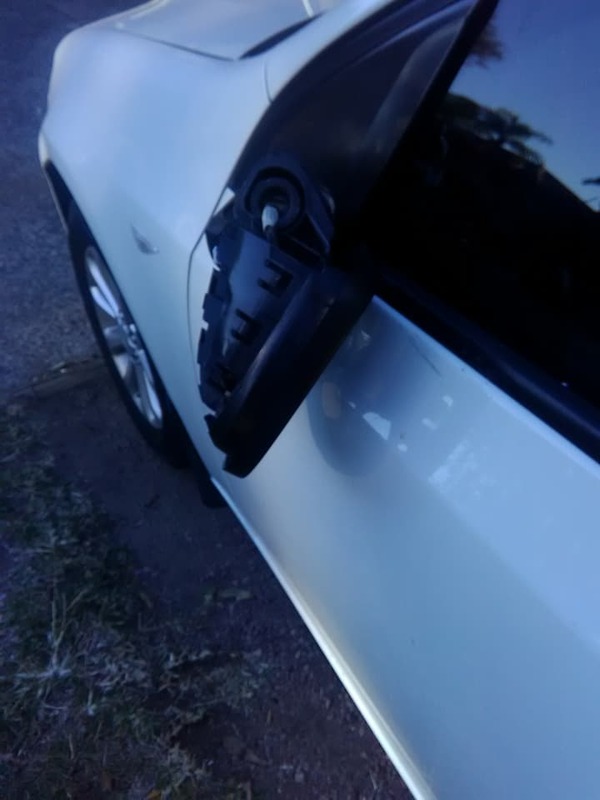 Tim is now home and checking out the car and the dashcam to see what happened but at least he isn't angry and has taken the rest of the day off work, I am still upset. 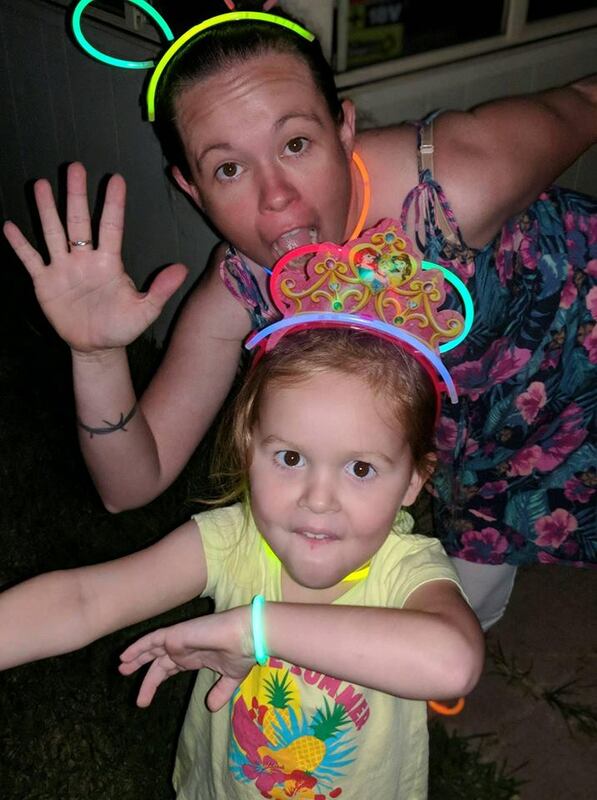 Well I hope everyone is having or had a good weekend as I can say I did. 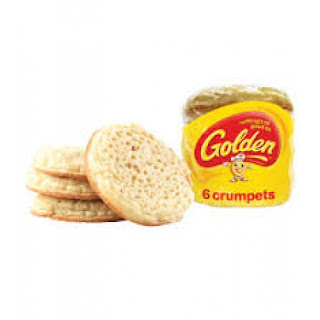 This morning I went to my aqua aerobics and then to the shops to get another packet of Golden Crumpets has to be Golden Crumpets no other brand are as nice, just saying. Anyway here is this weeks did you know facts. Around 75% of people who play the radio or other music in the car sing along to the music. Hello everyone this Thursday, it is a cool day here after I dropped Leo of at school I had a doctors appointment just to get some scripts now I am home with nothing else to do till I have to go and get Leo from school this afternoon. How is everyone this Wednesday it is a nice day not to cold but I have a lot of pain in my left ankle today so sitting and doing nothing is on the cards today. Being Wednesday it is have you heard of day so have you heard of: Garrett Morgan? Garrett Augustus Morgan was an award-winning American inventor and community leader of African-American descent, he was born on the 4th March 1877. So what did he invent that people might have heard of or use well he invented an early version of a gas mask called a smoke hood but no that isn't the thing that is used today, that would be the traffic light. He created the first traffic light that included a third “warning” position which is standard today, he also developed a chemical that was used in hair-straightening products. He was born in Claysville his parents were former slaves his father being owned by Confederate Colonel John H Morgan of Morgan's Raiders fame, his mother was also half native American, he had one brother Frank. He had a sixth-grade education from Branch Elementary School and at age 16 he moved to Cincinnati inn search of employment. He spent most of his teenage years working as a handyman and was lucky enough to hire a tutor and continue his studies while working. In 1895, he moved to Cleveland, Ohio,where he began repairing sewing machines for a clothing manufacturer. This experience with repairing sewing machines was the impetus for Morgan's interest in how things work. His first invention, developed during this period, was a belt fastener for sewing machines. Throughout this period of time, before his first patent in 1912, he was slowly building his reputation in Cleveland for his skill at fixing things. In 1907, Morgan with nearly a decade of experience with sewing machines, finally opened up his own sewing machine and shoe repair shop. In 1908, Morgan became more conscious of his heritage and helped found the Cleveland Association of Coloured Men. In 1909, he and his wife Mary Anne expanded their business ventures by opening a shop called Morgan's Cut Rate Ladies Clothing Store. The shop had 32 employees, and made coats, suits, dresses, and other clothing. Around 1910 his interest in repairing other people's inventions waned, and he became interested in developing some of his own. He was the subject of a newspaper feature, for a heroic rescue in 1916 of workers trapped within a water intake tunnel, 50ft (15m) beneath Lake Erie. He performed his rescue using a hood fashioned to protect his eyes from smoke and featuring a series of air tubes that hung near the ground to draw clean air beneath the rising smoke. This enabled Morgan to lengthen his ability to endure the inhospitable conditions of a smoke-filled room. Morgan is also credited as the first African American in Cleveland to own a car. The smoke hood was completed circa 1912. He received his patent for it that year as well. The successful invention of the smoke hood precipitated the launch of the National Safety Device Company in 1914. It is unknown if the smoke hood brought him any commercial success. In 1913 he incorporated hair care products into his growing list of patents and launched the G. A. Morgan Hair Refining Company, which sold hair care products, including his patented hair straightening cream, a hair colouring, and a hair straightening comb invented by Morgan. 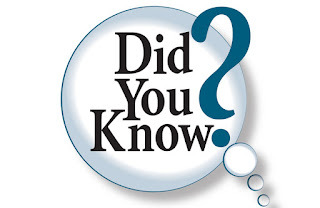 The first American-made automobiles were introduced to consumers just before the turn of the twentieth century, and pedestrians, bicycles, animal-drawn wagons and motor vehicles all had to share the same roads. To deal with the growing problem of traffic accidents, a number of versions of traffic signalling devices began to be developed, starting around 1913. 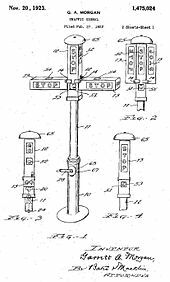 After he had witnessed a serious accident at an intersection, and he filed a patent for traffic control device having a third "warning" position in 1922. The patent was granted in 1923,though this was not the first system with a warning, a three light system being invented in 1920 by William Potts and previous systems having audible warnings. Later in life he developed glaucoma and by 1943 was functionally blind. He had poor health the rest of his life, but continued to work on his inventions. One of his last was a self-extinguishing cigarette, which used a small plastic pellet filled with water placed just before the filter. He died on July 27, 1963 aged 86 and is buried at Lake View Cemetery in Cleveland. Hello Tuesday, not as cold this morning, of course I am in track pants and socks on my feet, not thick songs and I only need a tee shirt. I have taken Leo to school now I am home and have no other plans for the day. 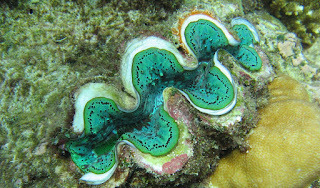 Well giant clams do exist and they are really huge a normal size clam is about the size of a human hand but the giant clam can be bigger than a human, now that is huge. They are thought to live up too 100yrs and can grow to 1.2 metres or 4ft across, their enormous thick shells have zigzag edges that fit together like teeth. 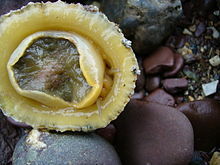 Their shell is pretty indestructible but the clam inside does get eaten by other animals such as eels, fish and starfish. Humans hunt and eat giant clams as well and they are now in danger of dying out. However, since they can't chase you or even move at all because as adults they stay in one place stuck to the seabed and feed on passing plankton, there is no reason to fear them so they are not as tough as they look or as scary as in the old stories. Hello all it is Monday afternoon here now it was another cold start to the day but it has warmed up no aqua class this morning went with Jessica to sort out her rent and then to the shops before home again. The thumb is such an important part of the human body that it has a special section, separate from the area that controls the fingers, reserved for it in the brain. Liechtenstein used to have the world's smallest army, there was one soldier, yes one. He served his country until his death at age 85. Abraham Lincoln's mother died from drinking milk from a cow which, when foraging in the woods had eaten some poisonous snake root. This Thursday has been a busy day for me I did not want to get up when my alarm went off this morning but get up I did and after taking Leo to school I went and picked up his mum and the two of us went and did some Mother's Day shopping. Leo had me get something for his mum for Mother's Day, it had to NOT PINK and something that just said Jessica, I got her a long (in length) light weight winter cardigan black in colour and it met with his approval. The day started out cool and ended up warm, by the time I got home I had enough time to eat lunch have a nap and go get Leo from school again. We are now home and I will soon go have a bath. Hello Wednesday still Wednesday morning here for another16 minutes, I did not want to get up this morning but of course staying in bed was out of the question. So it is have you heard of day and today I am asking if you have heard of Edson Arantes Di Nascimento....yes/no.....I have heard of him when I was watching “The Chase” but know nothing about him. Anyway he was a football player aka soccer player, he was better known as Pelé, he was a Brazilian and considered the greatest World Cup player of all time, his Brazilian team won three World Cups, although he missed one of the finals through injury. He scored twelve goals in finals tournaments, his first against Wales in 1958, He started club football with Santos at just 15yrs of age and played for Brazil at 16yrs of age, when he scored after just ten minutes against Argentina. He scored his first thousand goals in only 909 games, at the end of his career he played for New York Cosmos in the U S A. In his last game against his old club Santos he played for both sides during the match and he scored, of course. In 1999, he was voted World Player of the Century by the International Federation of Football History & Statistics (IFFHS), and was one of the two joint winners of the FIFA Player of the Century award. 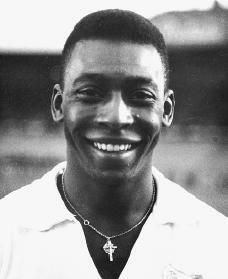 That same year, Pelé was elected Athlete of the Century by the International Olympic Committee. According to the IFFHS, Pelé is the most successful league goal-scorer in the world, scoring 1281 goals in 1363 games, which included unofficial friendlies and tour games. During his playing days, Pelé was for a period the best-paid athlete in the world. 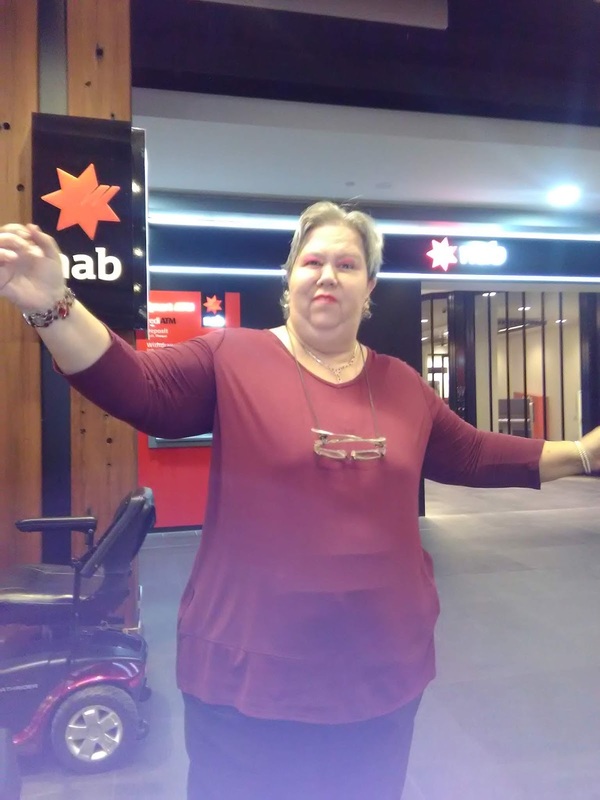 Good morning Tuesday, yesterday I went to my aqua class and it went ok, getting out of the pool I had to take it slow and make sure I placed my left foot flat on the step to protect the achilles tendon. 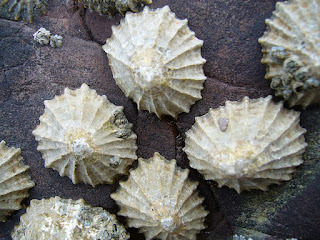 Well being Tuesday means it is Indestructible Creatures day, today's creature is something called a Limpet, another creature I have not heard of. They are a type of snail with super strong, thick shells which make them near impossible to budge. 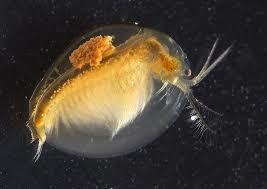 Inside their shells they have special tongues covered with tiny teeth, which they use for scraping algae. These teeth are strengthened with iron and look like miniature daggers and they hold the record for being the hardest material known to be made by any animal or plant. 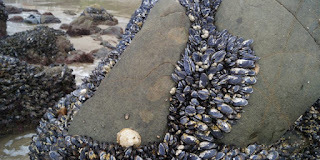 Their teeth are so hard that as they feed they actually scrape lines into the rock itself, you can spot where a limpet has been by the rows of little grooves. They cling to rocks using their powerful muscles and a kinda gluey slime. 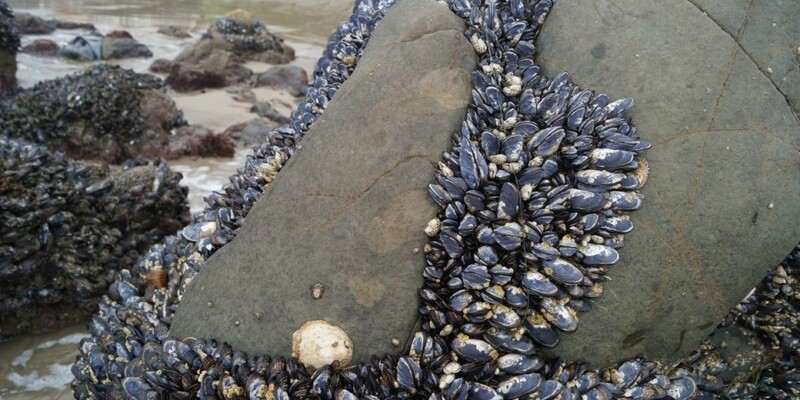 When the tide is in they crawl around underwater and feed, when the tide is out they clamp themselves to a rock to stay damp and safe from predators. Good morning, haven't heard from me for a few days, as I don't blog on a weekend generally speaking. Saturday I did a casserole for lunch and Jessica, Leo, Kathy-Lee & Summer came for lunch, Tim doesn't work Saturdays so he was here as well and even though he says he doesn't like casseroles he ate it. After lunch Tim & I went to the square (local shopping centre) to do a bit of shopping and I was able to hire a motorised scooter so had no problem getting around. I saw the GP on Friday afternoon and he said that I have torn my achilles tendon (which I knew) and to stay off it as much as possible. He also said I should have physio which I am not keen on, the ankle is healing the pain level has gone from an 8 to around a 2. I am going to my aqua class this morning so we will see how that goes. 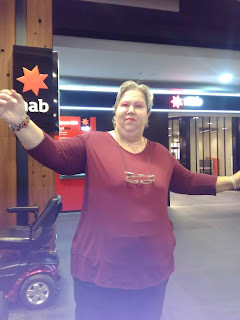 Good morning world, here I am on this cold Thursday morning, I didn't get around to doing a post yesterday, I was either busy or tired and just not up to it but here I am this morning doing a post before I go visiting blogs. I just had to go and get dressed, I am not one for staying in my nightie for ages maybe when I hit my 70's that will change, mum spends pretty much all day ever day in her nightie but that has come about during the last decade only. When I say I have been tired, I mean fall asleep tired, yesterday while ironing Tim's work shirts I found myself falling asleep and had to stop and go have a lay down, I slept for 1hr 30mins. This is becoming a worry on Tuesday morning I had to come home after I took Leo to school and go back to bed for 2hrs. Some good news is that mum got a letter yesterday telling her that she has her hip replacement done on the 30th now that is good news. She has her appointment with the pre opp people on Tuesday so fingers crossed all goes well. Yesterday after I took Leo to school I had to go to the chemist and get Leo's Webster pack and take it to the school, all that walking didn't help my ankle. Yes I followed the doctors advice and didn't go to my aqua class, he said I shouldn't go till after I have been back to see my GP. Well hello Tuesday, I am up and dressed, Leo is here and in around 90 minutes I will drive him to school. He is naturally looking forward to school. So yesterday I went and had the ultrasound of my ankle done and yeah I have torn my Achilles tendon not a complete tear around 80-90%, now I have to wait for my GP to get the report and asks to see me to tell me what next. So being Tuesday that means it is indestructible creatures day and this week it is the “Seed Shrimp” heard of it, nope, you are not alone. They are tiny little crustaceans that are related to crabs and lobsters and live in water near the, bottom or as part of a plankton which is a mass of tiny living things that float around in the water and are usually eaten by other animals, but not humans. To help them stay safe each Seed Shrimp lives inside its own little shell, which it can clamp tight shut, making it look just like a seed. In their shell they are often able to pass safely through the body of whatever has eaten it such as a frog, then they carry on with whatever they were doing. Seed Shrimps have very tough eggs, one species lives in ponds that often dry up, its eggs can survive sitting on the dry ground for weeks and then they can hatch when the water returns. In tests they have survived being frozen, blasted with radiation and deprived of oxygen, that's bloody tough.